While I was painting the flower bouquet, I remembered these photos and how I’d always meant to paint the scene. Only at the time, I thought I’d use watercolours. 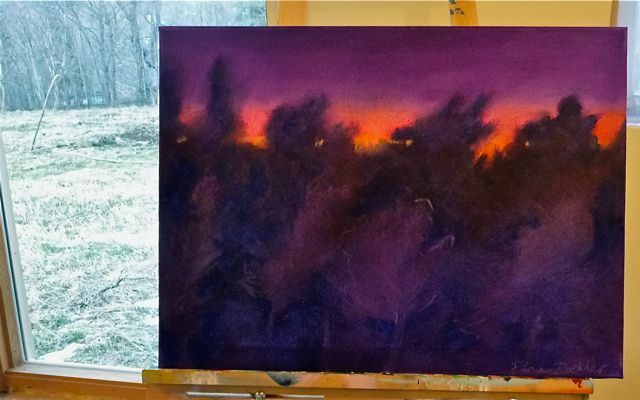 Now that I’m experimenting with oil paints, I really wanted to interpret the scene with my oil paints and oil sticks. 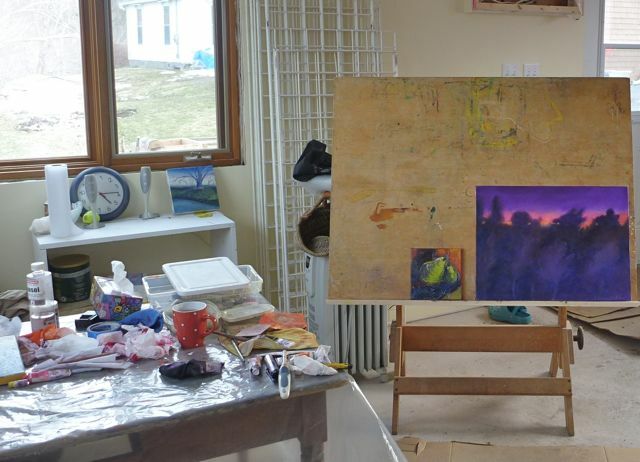 Fortunately, I like to work on several paintings at once. 😉 I think it keeps my work more spontaneous and it allows time for the oils to dry. So, I set aside the bouquet painting, for now, and pulled out a brand new white canvas. It is always a total thrill to start a new piece, but nerve-wracking too. 1. 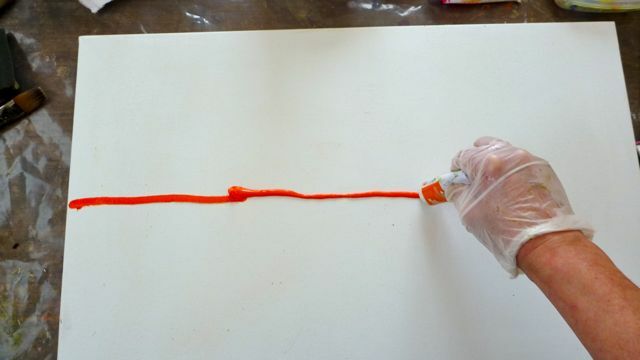 Squeeze out a line of orange paint. 2. 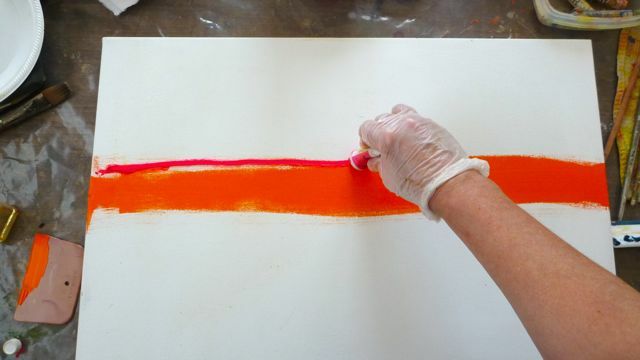 Drag the paint across the canvas with card or a squeegee. 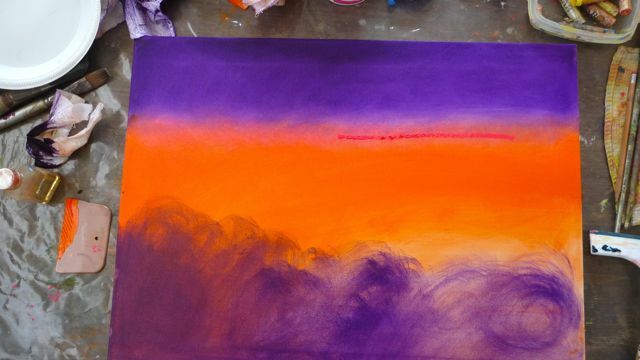 I wanted to blend a pink with the orange in order to get a variation of colour in the sunset. 3. 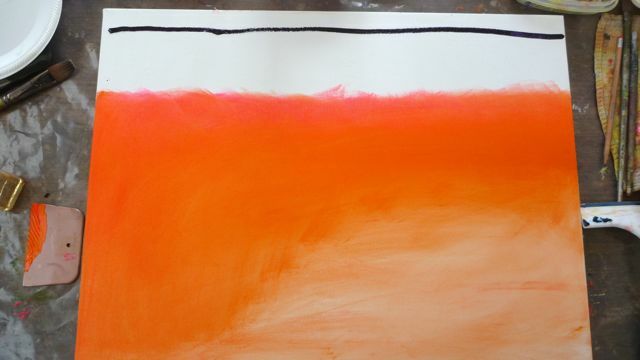 Apply a hot pink — "Opera" from Holbein. 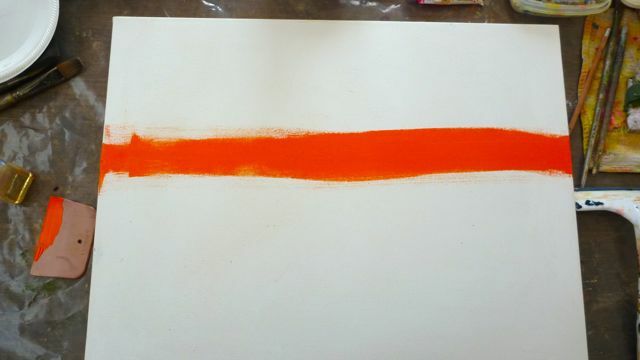 I don’t have very many oil sticks yet, so that’s why I’m using colour out of the tube. 4. Squeeze out a line of purple. I wiped the paint into the canvas with a cotton rag (an old bed-sheet torn into a lot of pieces)! 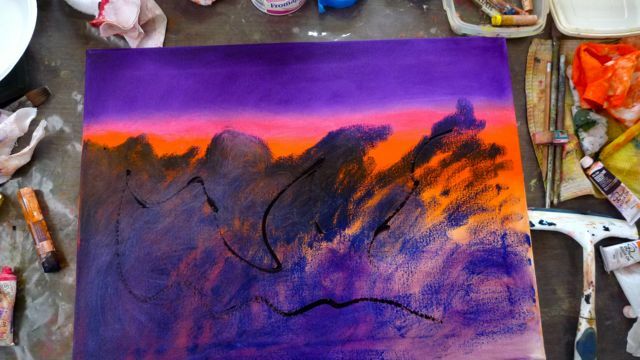 And rubbing and wiping with a cloth is a great way to blend the colours where they meet. 5. Wipe trees into the painting. 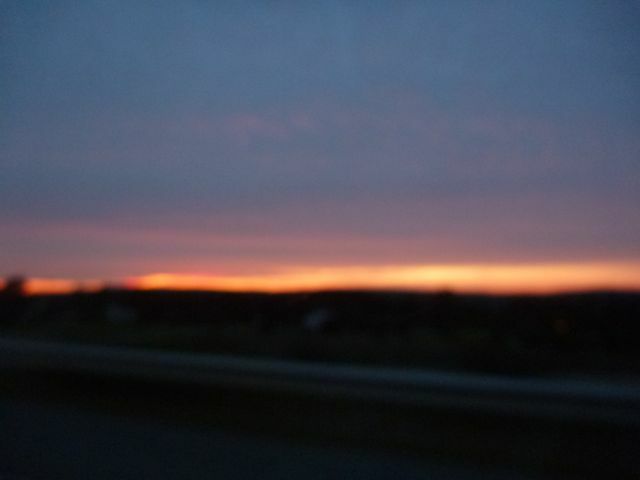 It was really difficult to cover that gorgeous orange, but then it wouldn’t have been a sunset anymore, would it? 6. More trees, more paint. You can see that I squeezed more colour out of the tube as well as using my ultramarine oil stick. Late in the game I added a line of yellow to the sunset and blended it in using q-tips. 7. I added yellow afterwards. The actual colour of the painting is a pretty accurate in this photo. I’ve only been working in this studio space for a couple of weeks. I was working in the house over the winter — you can see the room through the window. It’s the farthest one at the front of the house. This outside studio is much nicer because I can stomp around with my muddy garden boots. Even better, Larry works in here creating metal pieces. I’m going to tell you all about that the next time! I’m happy with the mood I got in this painting. 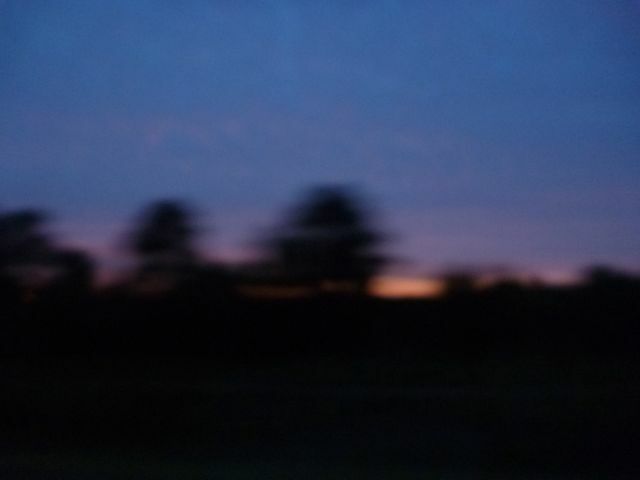 I think it has that mystery and slight foreboding that I felt about the dark landscape rushing by. 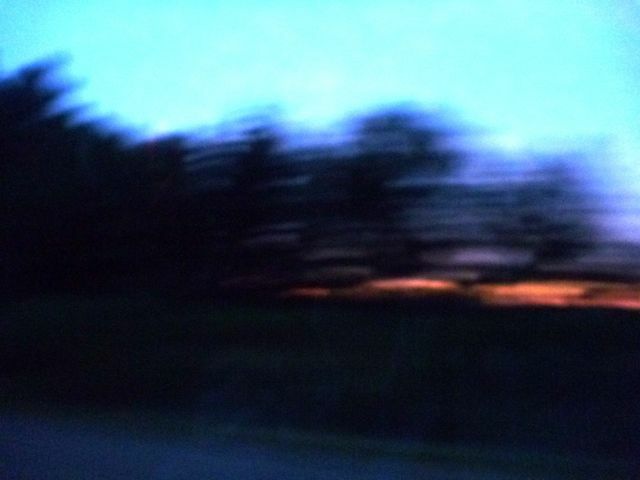 It’s interesting how differently we perceive a night landscape verses a daytime one. 9. 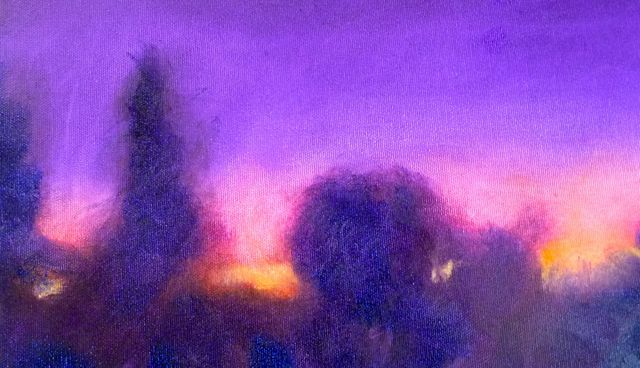 I 'lifted' some tree shapes in the foreground by rubbing off some of the paint. Thank you Ellen! I hope all is well with you and Eve. I think you’d like trying this technique out actually! Thanks for stopping by! I love colour and I’m having a good time with these oils. Gorgeous colors! Of course, you’re working with my favorites, orange and purple. I’m looking forward to exploring your blog. Thanks for visiting mine. Fabulous – – -and yes, you caught the mood. I am so excited for you, how a one day workshop (Boucher) pulled something out of you that is spilling onto your canvases! Carol, I am always so inspired by watching others work and studying their approach and I suppose that we look for the things that we NEED to see. So, when Wayne dragged that sock across my masterpiece, I had to fight with my urge to make him stop. At the same time, I was spellbound and fascinated that he had the audacity to direct the flow of colour and to blur the edges literally and figuratively!! I try to go to workshops with an open mind and to emulate that person while I’m there anyway because it is such a privelegde to step into someone elses shoes and to try and see the way they do. Thanks for your great comments Carol!